The mugs you love to share now give you more reasion to inspire. 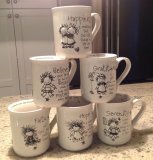 Each mug has Marci's encouraging message on the back. Share with friends, family & neighbors.